To expand the flavor of the cherry filling, try stiring in 1 teaspoon almond extract. For a nice defined crimped crust, lay the top pastry over the cherry filling and press it firmly against the overhang of the bottom crust. Fold the pastry together and over to build up an even ridge of dough. Use the handle of a wooden spoon to mark evenly spaced sections to twist with your fingers into a decorative edge. Have a foil collar or aluminum pastry shields at the ready to prevent over-browning around the top edges of the pastry. You don’t want to under bake the pie, or you may have a gummy bottom crust. For a glazy top crust, brush it with some milk or cream and sprinkle on some sparkly sugar, before sliding it into the oven. Cut slits into the top crust or use small cookie cutters to create vents to release steam. Two cans of apple pie filling can be substituted for cherry pie filling. 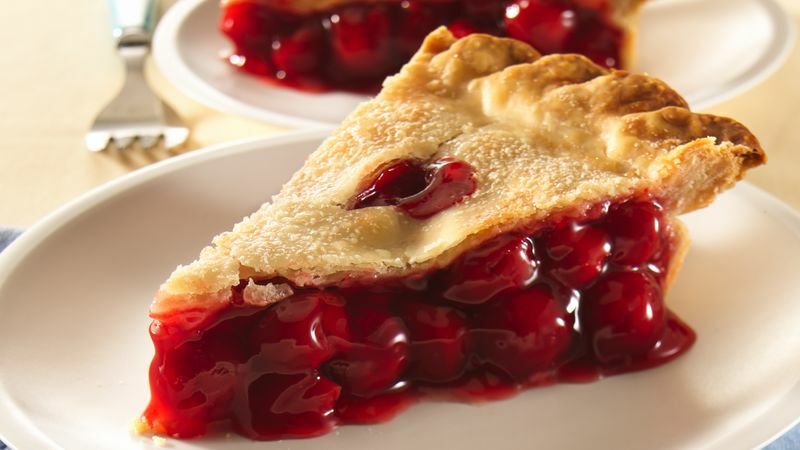 This easy cherry pie looks professional but is so simple, anyone can make it. No extra steps, just basic assembly is all that’s needed to create this classic dessert. When it comes to pie, the crust can make or break the entire dessert. So if dough from scratch isn’t one of your skills, using refrigerated pie crust is a quick and easy way to make perfect pie crust every time. If you’re feeling extra fancy, use excess dough to decorate the top crust with dough cut-outs you can make using a knife or cookie cutters. And if you're looking for more cherry pie recipes, we have 'em—from classic, to mini, to new and with a twist!